I had a car accident on Friday. I’m fine, but it could have been a heck of a lot worse than it was. You see, I skidded on some ice on my way home from work, went into a spin, drifted into the lane to my right, and was struck by a semi truck. As for me, I was super lucky. I didn’t get hurt, jarred, bruised, injured, or–most importantly–killed. But I could have been. And that’s made me realize that the things that are the most important to me are the little things most of us take for granted. Since Friday, I’ve envisioned the accident in my mind dozens of times. Each time, I think about my car spinning to the right and that semi truck slamming into the front of my car. If I had been going a little faster or my car had turned a little differently, I would have ended up in front of that semi instead of being knocked across the median in the opposite direction. I keep thinking about that, replaying that single moment of impact in my mind over and over again. It’s made me take a good look at my life and the things and people around me. I’ve done some pretty good thinking about what’s important to me. One of the first things that I thought about after the accident was my wife. Obviously. She was a nervous wreck–and has been all weekend–and has threatened for the better part of three days to stab me for almost getting myself killed. Just being able to come home to her, watch some Friends, and eat dinner was a blessing. Being able to plop down on the couch, hate Ross Gellar, and eat a turkey burger was absolutely sublime. It made me happy. Just ordinary, day-to-day, married life was–and is–enough for me. You want to know what the highlight of my day on Friday was? Not the accident, obviously. The fact that my wife made me cocoa in a Star Wars mug. It was such a small gesture in the bigger picture, but it meant so incredibly much to me, how that one mug of awesome lifted my spirits so much. The same goes for the rest of my family and my friends, too. I am more than grateful for the amount of calls and texts (and Tweets!) that I got from people about my accident. I really do have the best people in the world around me. It’s amazing to me how just a few little messages can take a huge burden off of you. The idea that lots of people took the time out of their day to wish me well means more than almost anything else could. Like I said, it’s small stuff. It’s a text message or a Tweet, a few bytes of data. But that people thought enough to say something and send good vibes my way meant more than any of you can understand. This may sound silly, but the fact that I ran a mile on Friday felt like just as much of an accomplishment as running my half-marathon back in October. It was not the best mile I’d ever run. It wasn’t the worst, either. It was just a simple, completely ordinary, mundane mile. Because I was able to run. And I did. 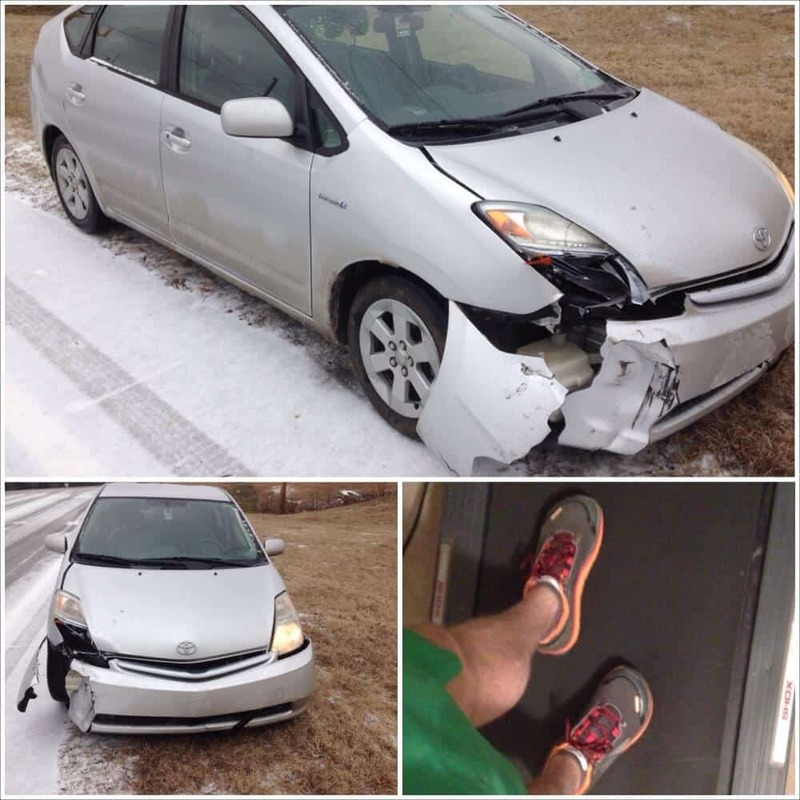 I had an excuse–an incredibly valid excuse, I think–not to run. I could have said “screw it” to my #RunStreak and watched an extra episode of Friends, but I didn’t. I went upstairs, I turned on the treadmill, I and ran. For no other reason than because I could. I felt like because I could run that I had to run. Does that make sense? I mean, there is going to come a day when I won’t be able to run anymore. Whether it’s from old age or injury or something else entirely, there will be a time when I am no longer physically able to lace up and put one foot in front of the other. That day was almost Friday. Had just a few things been different, I wouldn’t have been able to run for who knows how long. But things weren’t that bad. In fact, things were awesome. My car still ran, I have car insurance that will get it fixed up, and I literally didn’t have a bruise on me. I was healthy. I was alive. So I had to run. I felt like that if I didn’t run, I’d be wasting…something. I just dind’t know what. Maybe I’d be wasting time or wasting a perfect opportunity. Wasting my ability or even my life. I don’t know. It was all very existential and emotional for me. I don’t know precisely what I felt like I’d be wasting if I didn’t run, I just knew that I’d be wasting something. I felt like I owed it whatever it was that kept me safe through an absurd situation that I didn’t waste anything. It was just a mile. But after that mile, I felt emotional and free and accomplished. For the first time in a very long time, I felt like all the small things in my life added up into something great. My friends, my family, my wife, my running, everything had all come together to show me in a moment of sublimnity that I had a lot of things to be grateful for. On their own, they’re all very small things that I probably take for granted. The ability to run. The love (and cocoa!) of a wonderful woman. The fact that I have friends, online and off, who care about me. On their own, they are quite easy to overlook and consider ordinary. But after being thrown across the highway by a semi truck, I am pretty damned grateful for ordinary. What are the small things in your life that you’re grateful for? Oh wow, B.J.! So glad you are ok! Groot is the perfect name for your little Prius! I try daily to do this also. Glad you are alright! so glad you weren’t hurt! stopping by for #fitgeekfriday!